While we strongly believe that there is no such thing as a bad breed or a bad dog, not every dog is suited for our off-leash, open-play environment. We take our doggie guests’ safety very seriously, so each one must first complete a thorough Meet & Greet to ensure that they are a good fit for daycare. For the Meet & Greet, please arrive with your dog on a leash or slip lead with a collar/harness both in the parking lot and upon entry into the lobby. The evaluation process with your dog will take approximately 20-30 minutes with our trained evaluator. During this time, we would love to show you around, address your questions and you can even watch the playroom cameras! The process is very easy and there is nothing to be nervous about at Dogtopia – we look forward to getting to know your pup better! *Please note that although we are an open-play environment, we do allow a private nap for each dog in individual crates from 12 p.m. to 2 p.m. Similar to children in a daycare, this allows a short rest for the dogs and also allows staff to prepare and serve meals and medications (when applicable) and thoroughly clean the playroom before an afternoon of open play! Puppies often need more frequent naps and our team is trained to pick up on puppy cues, so you may see puppies in and out of play throughout the day. Your dog(s) on a leash with a collar or harness upon entry. We appreciate receiving the Registration Forms prior to your visit, but if you have not submitted the Registration Form or vaccination records in advance, please bring them with you. WHO CAN STAY WITH US? Dogs must first undergo a Meet & Greet with our Dogtopia team. All dogs must be at least 12 weeks of age or older, and fully vaccinated. All dogs 7 months or older must be spayed or neutered. Depending on development, sooner alteration may be required by our facility. All dogs must have up-to-date vaccinations. Pet parents must submit written proof of Rabies, DHLPP and Bordetella vaccinations. Vaccinations must be given by a vet 48 hours before attending daycare or boarding (7 days prior preferred). See below for more details on vaccinations. All dogs must be in good health. Pet parents will certify that their dog(s) are in good health and have not been ill with a communicable condition within the last 30 days. Upon admission, all dogs must be free of any condition that could potentially jeopardize other guests, including fleas or ticks. Dogs that have been ill with a communicable condition in the last 30 days will require veterinarian certification of health to be admitted or readmitted. All dogs must be non-aggressive and not food or toy-protective. Pet parents will certify their dogs have not harmed or shown any aggressive or threatening behavior toward any person or dog. The safety and health of all of our guests is our top priority. All dogs must have a complete, up-to-date, and approved application on file to attend daycare or board with us. It is also strongly recommended that a dog attend at least one day of daycare (preferably three) prior to boarding. This will help us get to know your dog’s personality and preference, and allow your dog to know he/she is going home, get to know staff and other dogs and ensure they are comfortable in our open-play environment. 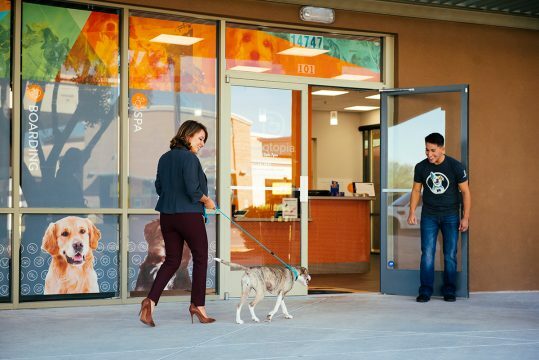 Because dogs are a really big deal to us, evaluation day at Dogtopia is fun for the whole family – consider it an introduction to our open-play environment, perfectly suited for your pup’s fitness and social life. In fact, don’t be surprised if your furry child meets his or her BFFF (Best Furry Friend Forever) while they are here! Rabies is required once on or before 16 weeks of age in puppies, boosted again 1 year later (1 year, 4 mos. of age) and then every three years going forward. Dogs are required by law to be vaccinated against the rabies virus because this deadly virus can spread to humans. If an unvaccinated dog breaks the skin of a person or another dog, your local laws will require you to have the dog quarantined for a minimum of 10 days (could be as long as 6 months.) Dogtopia allows your pup to come play once he/she is both 12 weeks old AND fully vaccinated. DHLPP is required as a puppy series beginning at 6-8 weeks old, boosted twice at 3-week intervals and again a year later. Like rabies, after the first year, the distemper/parvo combination vaccine can be given every three years. Leptospirosis (the “L” in some Distemper combination vaccines) should be included in the annual combination vaccine due to recent increases in Leptospirosis cases. Leptospirosis needs to be boosted annually. This is important because Leptospirosis can be deadly to dogs and is transferable to humans! Bordetella is required to be current. Most veterinarians recommend the Bordetella vaccine be given every 6 months to maintain a high level of immunity for dogs who are often in social settings. The Bordetella vaccine helps control and prevent the spread of germs that cause canine cough. If a dog that has been vaccinated with the Bordetella vaccine still acquires canine cough, they will have a less severe form that resolves faster than a dog who is not vaccinated. The germs that cause canine cough are very similar to the common cold in humans with mild coughing and sometimes a runny nose. Symptoms usually resolve within a week. The influenza vaccine is not required, but highly recommended if available in your area. In order to allow time for your dog to develop an immune response from vaccines, please make veterinary appointments 7-10 days prior to attending Dogtopia. Check with your veterinarian to see if your dog’s vaccine boosters (not the initial vaccine) may provide adequate immune response sooner than 7 days. 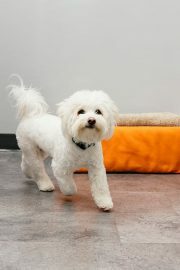 Your dog will love playing all day with like-minded furry friends in our safe and supervised playrooms. We’re the perfect home away from home for your dog when they need a sleepover stay. 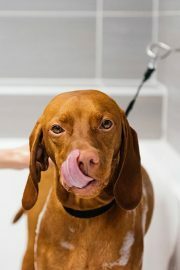 Get your pup squeaky clean and feeling like a million bones at our full service dog spa. At Dogtopia®, we’re a unique breed. We love and care for your pup like they are our own. 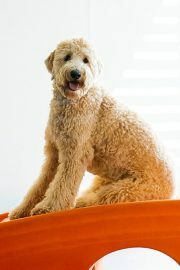 We realize that your dog is a furry member of your family and they deserve the highest level of care. 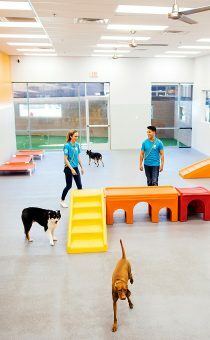 With our award-winning daycare, boarding, and spa services, you’ll be treating your pup to their most exciting day ever! The Dogtopia Foundation enables dogs to positively change the world. To accomplish this, we currently are funding programs focused around three worthy causes: Service Dogs for Veterans, Youth Literacy Programs and Employment Initiative for Adults with Autism. It’s easy to book dog daycare, boarding and spa services at Dogtopia using our mobile app. Once you’ve created a profile, you can request appointments, review your upcoming schedule and check your appointment history. You can also keep up-to-date with the latest news and access our webcams to watch your pup play with their BFFFs (Best Furry Friends Forever). In a rush? 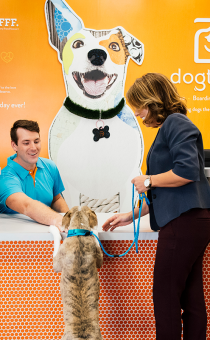 Easily request a Dogtopia employee greet you at your car when you arrive and assist you by bringing your dog into daycare for you (select locations only).